I had planned to learn to spin over the winter. But once the weather turned wet and chilly I came down with a flu bug and didn't really feel much like learning anything new. So this has become the winter of crochet mats. The patterns called for a smaller crochet hook and finer thread to make a 10 inch mat but all I had was four ply knitting cotton so I just set to and ended up with a small tablecloth or large centre mat whichever way you look at it. This one I think I went wrong somewhere as it won't lie flat, even after starching and ironing. The bad weather is continuing and Steve spent yesterday overhauling the spinning wheel. It has done a lot of miles and just needed a clean and a couple of new tension springs to bring it back to peak condition. A little oil and then it was good to go. Now... I do not know how to spin. I am learning from a book and from youtube videos. 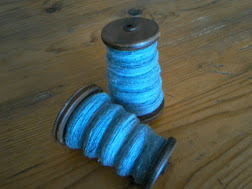 I started by simply practicing with the treadle and not actually spinning at all. This sounded like a good idea to get used to controlling the speed, however once I actually attached wool to it and tried to spin, the feel of the treadle was totally different and I didn't think my earlier practicing was of any use whatsoever. And after a few choice swear words I thought I better put it away and start again tomorrow. There are fine tuning issues, the wool would twist and then not wind on to the bobbin but then sometimes it worked fine..., things that if I was a spinner, or if I had a spinner here to help me, would I am sure have an easy explanation and solution. My efforts are beyond pathetic... oh well... not wasted as I can use all this as stuffing for knitted or sewn toy animals (another project for future). It doesn't help that Molly decided to sleep on my lovely 'fluffy as a cloud' basket of carded fleece, which was somewhat less than fluffy or cloud like when she got off! I am not giving up, but I don't think I shall be spinning for Rumpelstiltskin any time soon. More pictures of the spinning wheel being cleaned over at Steve's site for those who like to see the technical nitty gritty bits. I've enjoyed reading your blog, and you are right, there are a lot of similarities with our two moves, but the biggest difference has to be the weather, because of the cold winters we cannot grow citrus and olives, but most other fruits are OK due to the long season. Looking forward to what 2015 brings you. That is the one thing I can't abide... snow and the cold that goes with it. Otherwise I would have been very interested in Bulgaria as a possible destination... but it had to be somewhere with short and warm winters. Mind you its chilly here at the moment... but in another month we shall be in shirt sleeves... yippee. Lovely wheel! Keep at it, it takes time, but suddenly it "clicks" and you're spinning... best if you can practice in company, as it's a very rhythmic thing & you kind of pick up the rhythm as you spin along with other people & chat with them; you don't really notice you're doing it. But if my experience of taking an Indian charkha through customs is anything to go by, spinning is a pretty rare hobby in Spain now. You will also find that each time you sit at the wheel, it will take a while to get back into the swing of it. I usually spend the first ten minutes wondering what on earth has happened to my wheel, or whether someone's been fiddling with the tension, or if it maybe needs oiling. Needless to say, it's "pilot error" and I'm usually fine when something else grabs my attention & I go onto auto-pilot! So once it starts to "gel" make time for some longer sessions, so you can relax & get over the initial frustration. Thank you so much for the encouraging comments. Sadly there is no one else to spin with around here but I am continuing to practice and I am improving... the yarn is getting thinner and there are less lumpy bits... I've had some fun trying to ply but I think the single strands were too thick to start with. Now I need to find uses for all this interesting but unknittable wool! It's known as "art yarn"...! I used most of mine up in a peg-loom rug, and the rest in a rug knitted on 20mm needles. If yours is from a fleece that will felt, you could knit or crochet an oversize hat, then felt it - warm, comfortable & not too bad at keeping the rain out. Plying - it's very tempting to whizz along & let it do its own thing, and to some extent that works, probably better than trying to control it too much to achieve the perfect "balanced" yarn. But if your single holds together reasonably well, you can just wash it roughly to felt it slightly, weight it with an old iron or similar as it dries, and use it as is. Are you a member of a) Ravelry.com or b) the Online Guild of Weavers, Spinners & Dyers? Lots of virtual company, help & encouragement available in both "places", and you may find other members nearer to you than you'd think. Ooooh Thriftwizard you are a wizard indeed. Yes I am a member of Ravelry but I hadn't heard of the online guild of weavers... will be beavering over there as soon as.... I love that my inexpert first attempts can be called art yarn. lol. This is a great hobby! I shall be posting my first finished projects in a week or two... I just love the yarn even if it is all bobbly.